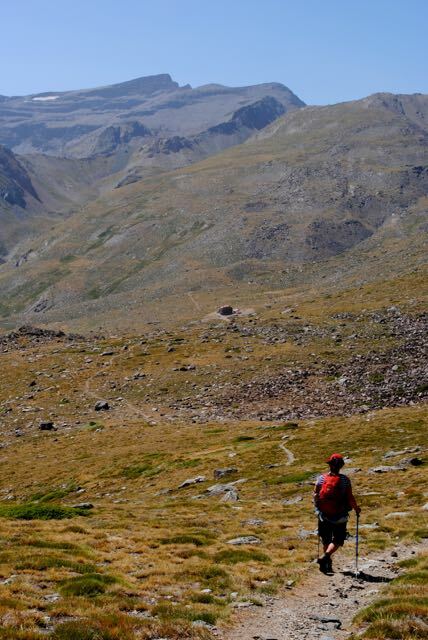 Treking in the Parque Nacional De Sierra Nevada, Spain’s highest mountain range, has many rewards and in the heat of summer one of the best is a swim in the Med an hour after hiking down from the 3500 mt peaks. Floating in the cooling waters off a busy beach packed with holiday makers it seemed a parallel universe to the empty and wild landscape in which we had spent the last 3 days. If you want to clamber around the top of Spain without crampons or skis you need to wait till June/ July for the snow to recede- in the Spring or Autumn a snowboarding trip followed by a swim in the sea is an even more surreal experience. 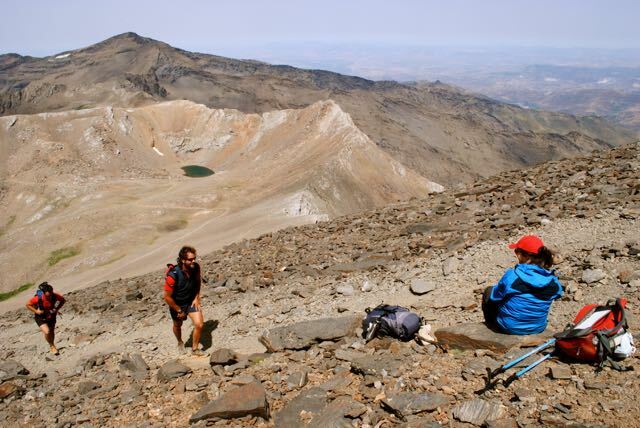 The highest peaks can be accessed either from the northern Granada side in Prado Llano, Euope’s most southerly ski resort or from the southern, Alpujarran side, walking up the old mule tracks that weave their way into the mountains from the white cubist style villages of Capileira and Trevelez. 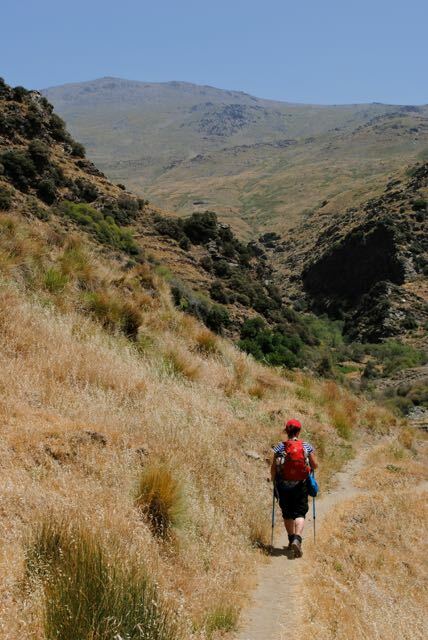 Such is the number of these tracks linking the cortijos, or farmsteads, which reach over 2000mts that there are a wealth of routes short or long to explore. 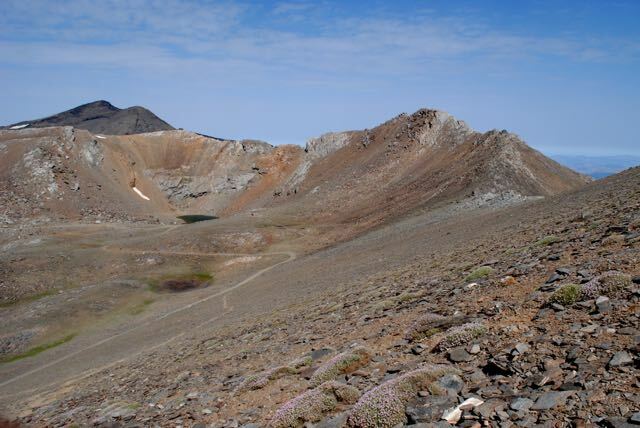 In the higher ranges there are many guided hikes and horse treks or you can avail of a service where you can walk unencumbered while somebody brings up all your gear by horse, sets up camp, cooks your dinner and opens the champagne. 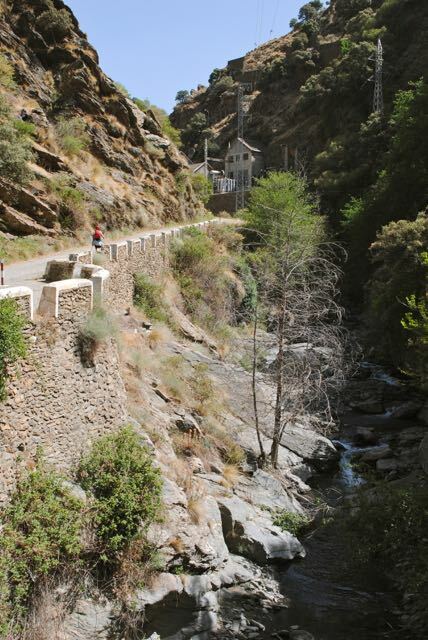 We had a less decadent itinerary when we set off from the hydropower station at La Cebadilla (1500mts) in the gorge of the Poqueira River a few kms north of Capileira. 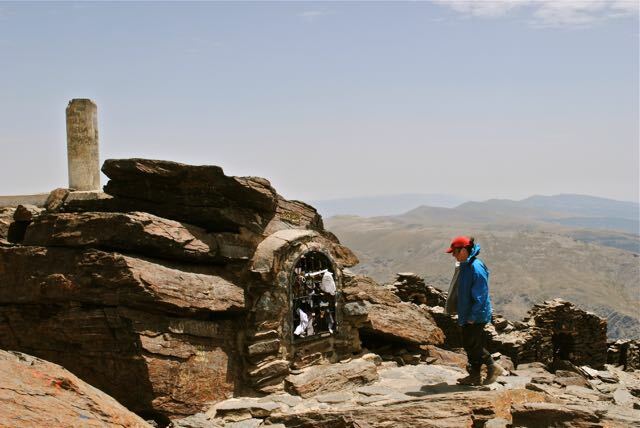 We had devised a roughly circular route from the Refugio Poqueira (2500mts) to take in the peaks of Mulhacen, ( 3479mts) the Iberian peninsula’s highest, and it’s near neighbor La Alcazaba (3364mts) the fortress, named for it’s formidable cliffs on three sides. 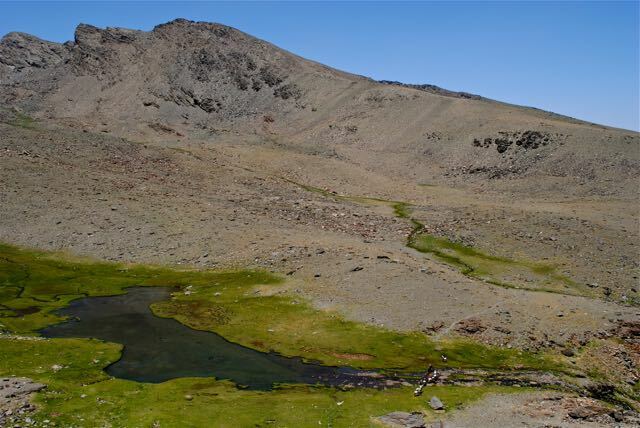 Due to the National Park status of 83000 hectares of the Sierra Nevada range, the area is highly protected and although camping is allowed with certain provisions you are required to notify the park authorities of your intentions. In practice however, if you behave sensibly and sensitively and camp or bivvy no more than one night in the same place, a blind eye is likely to be turned. These are serious mountains and as the D.O.E. leaflets on safety states-” Passing through the Sierra Nevada involves a high risk of accidents” and all the usual precautions should be followed. 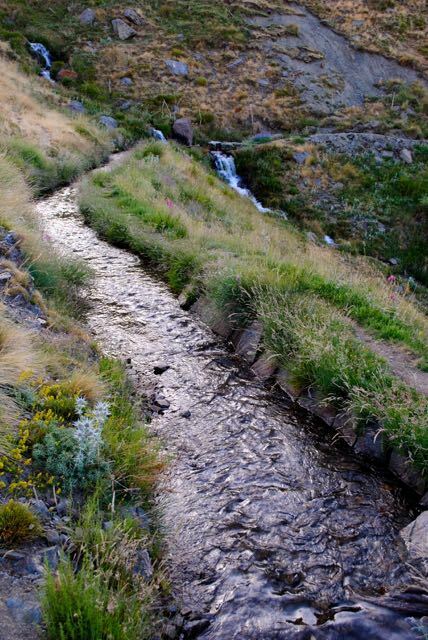 Everything was benign as we climbed the rugged track up the sides of the snow melt river gorge. We were grateful for the shade offered by the steep hillsides and groves of holm oak, chestnut, walnut and willow. At this relatively low altitude there was an abundance of wild roses, foxgloves and even bracken to remind us of home but here the warm air was full of a multitude of butterflies and the heady scent of thyme as we crushed it underfoot. The refugio came into view far above as we crisscrossed the river on simple bridges of wooden poles and flat stones, and above that the lower peak of Mulhacen looking deceptively close. and imagining life in the abandoned farmhouses scattered around us with their simple flat roofed construction and perfectly circular threshing floors projecting from the steeply sloping hillsides.A tough gradient took us up to the still used Cortijo de Las Tomas at 2150mts and over two of the areas acequias, the awe inspiring irrigation canals originally built by the Moors that contour the mountains delivering life giving water to hundreds of farmsteads . 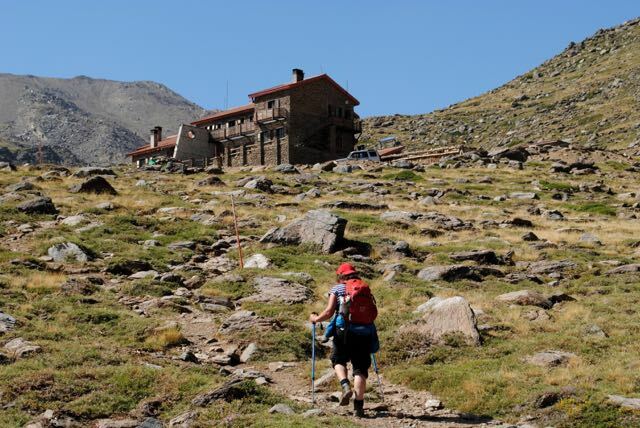 Cresting a ridge, the sturdy stone built Refugio Poqueira was a welcome sight and the cold beers on arrival a welcome taste. The refugio is open all year and can cater for over eighty people although after a busy weekend there were only three others sharing the facilities with us that night. The hardworking young couple who run the place offer four course dinner, breakfast, and supplied us with packed lunches for the following two days. You can also stock up on an assortment of requisites from compeed to chocolate and get advice on routes and conditions. The next morning we headed off up the Rio Mulhacen valley following the tall orange posts that guide climbers and skiers during the snowy seasons. Leaving the last of the running water behind, at 3000mts we came to the trans sierra road that until closed to public use in 1994 was the highest in Europe.Crossing the sierra at 3229mts just below Mt Veleta it’s an impressive piece of engineering but looking at it’s rough and narrow surface and precipitous drops we found it hard to imagine day trippers out for a Sunday drive. and enjoy our packed lunch under the watchful gaze of a cabra montes or mountain goat. The vista all around was sublime, rendered softer by a heat haze produced by a windless 20c -hard to imagine at 3500mts. The area contains a number of low circular or horseshoe shaped stone wall enclosures built by campers to protect them from the worse of the wind that can rip around the valley floor, one of which was to be our home for the night. As with much of the high sierras, from a distance the valley had looked pretty austere but up close a wonderfully varied microcosm revealed itself. 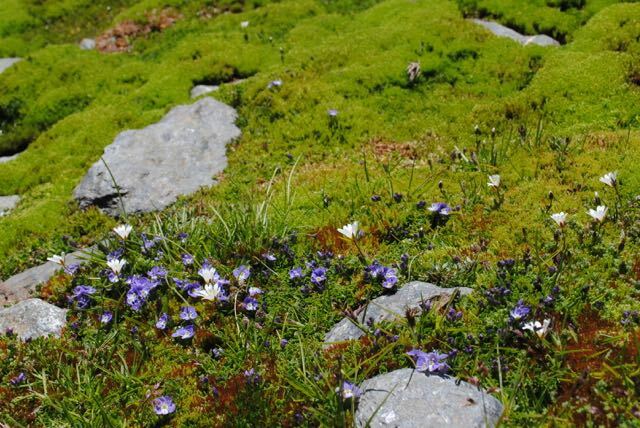 Alpine flowers in exquisite colors emerged from pin cushion mounds of 40 shades of green and a small group of cows munched contentedly on the lush grasses before being called by the matriarch of the herd up the steep zig zag path out of the valley and into the vastness beyond, leaving us alone- with the foxes. I had read about the increase in foxes scavenging food from campers at Siete Lagunas and posters at the refugio had warned of them. The advice was not to leave food in a zipped up tent as they would tear their way into it and the only real deterrent was a dog. So after we had finished our dinner, before settling into our sleeping bags for the night, I carefully stove all our remaining food into the bottom of my pack which I covered with rocks. Then we lay back and, as the sky darkened, watched the milky way appear above the sierras. Just as we fell Isleep we were startled by a sudden noise. Opening my eyes I looked straight into those of a fox at our feet, it’s snout in our other pack. My involuntary yelp drove it back over the wall and investigations revealed a forgotten chorizo sausage,which we promptly eat, sticking out of a side pocket. Falling back into a wary slumber we listened to a duet of the fox and a dog of some other campers barking at each other across the lake. As the moon rose the temperature dropped and the wind picked up. A loud whooshing noise up the head of the valley was followed after a few tense seconds by a short but sharp buffeting. It was wild and elemental but the sky remained clear and we were cosy enough in our bags. 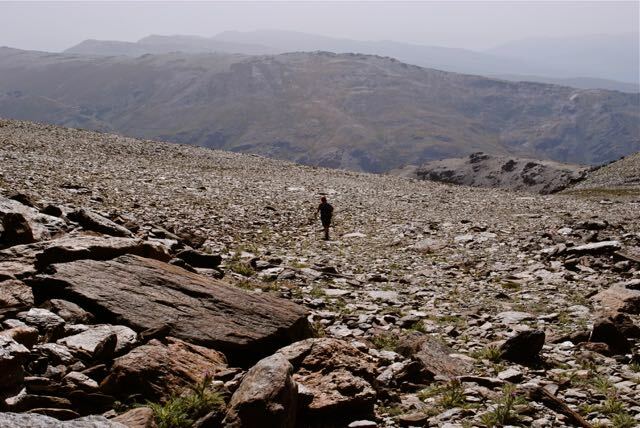 In the morning we stowed our packs against the bivvy wall and made our way up the shoulder of Alcazaba in a strong and gusty wind, climbing across a sea of shattered rock and shale to the final ridge to the summit. The cliffs fell away vertigiously to the north and the buffeting wind kept us well away from the precipice on the last couple of hundred metres. Our efforts were well rewarded by the views of the dramatic north face of Mulhacen and the spine of 3000mt peaks snaking away eastwards below us. Although the sun shone brightly the wind chill got us off the top fairly fast and back down to the top of the shoulder. From there we returned to Siete Laguna by a more direct but much steeper route- scrambling down the north end wall of the valley allowing us to explore the higher lakes as we followed the streams back to Laguna Hondera. Rested after a leisurely lunch we headed off, up out of the valley, looking back down to see a line of horse trekkers crossing the Culo de Perro. Much busier than on our previous nights stay we mixed with about 40 cyclists, climbers and hikers on the sunny terrace, relaxing weary muscles over a beer whilst gazing down across the ranges to the sea. Setting off under another clear blue sky in the morning, we retraced our original route alongside the tumbling river through clouds of butterflies stopping only to gorge ourselves on plump juicy cherries picked from the orchard of a long deserted cortijo. Our descent to the car was much quicker than the ascent, so before long we were having lunch at a chiringuitos, a beachside seafood restaurant followed by a refreshing swim that restored us to a state where we were once again looking forward to our next hiking trip.